Distinctive composition and sound design, bringing new ideas to theatre – from notated music to experimental electronic and algorithmic techniques. Over the last few years, I’ve worked as composer and sound designer on a number of theatre productions. In this work, I’ve deployed techniques developed over many years as a performer of new instrumental and electronic music. I’m drawn to music with a sense of the uncanny – soundworlds that get under the skin – and have tried to bring this to my work for theatre. In order to create a cohesive sonic experience, I’m particularly keen on projects which blur the boundaries between composition and sound design. In many of the sound cues on these pages, I’ve treated spot cues – such as the sound of a shovel scraping on the floor – as source material in musique concrète. I’ve denatured, combined and layered this material to create musical cues which have a strong sonic connection to the play. A classically trained musician with degrees in electroacoustics and robotics, I’m able to blend complex, original instrumental composition with the latest electronic and algorithmic techniques. I’m a fluent QLab programmer and am also versed in Max – software which originates from IRCAM, Paris. 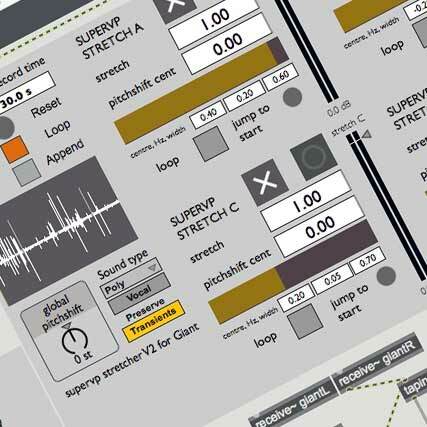 I use Max to transform sounds radically through dynamic and responsive processing. I am one of very few theatre composers in the UK to be using Max extensively in my work. As a published historian of sound culture, I can create or find material that’s suited to an era. In fact some of my non-theatre projects – such as The Machinery and HMS Alliance – have required me to compose highly accurate reconstructions of historic soundworlds. The Alliance piece was created in close consultation with veteran submariners – it’s a form of sonic documentary. I also create live scores for film and have been featured in the BFI seasons ‘Gothic – The Dark Heart of Film’ and ‘Sci fi – Days of Fear and Wonder’. Composition and sound design for The Hairy Ape (1922) – Eugene O’Neill’s expressionist masterpiece which uses the overwhelming sounds of an engine room on an ocean liner to explore dehumanisation in the age of modernity. Directed by Richard Jones. A transfer of the show from The Old Vic, London, to the Park Avenue Armory, New York. I adapted my original composition and sound design for The Armory’s vast drill hall. Production directed by Richard Jones. Some discoveries from the archives about the earliest European productions of The Hairy Ape, including the first London production which featured Paul Robeson as Yank. Even before the era of electronic sound, it was evidently a feat of endurance for the company to deliver their lines in the considerable noise of the stokehole. Composition and sound design for the The Twilight Zone – re-editing the orchestral underscore from the original series and counterpointing it with 21st century sounds and music of my own. The first official stage production of the classic CBS series. Script adapted by Anne Washburn, directed by Richard Jones. Predating the screwball comedies of the 1930s, this play by Moss Hart and George S. Kaufman was first performed in 1930, only two years after The Jazz Singer became the first commercial talking picture and a worldwide hit. I was sound designer on this revival of the play, presented over Christmas 2016 at The Young Vic Theatre, London. Directed by Richard Jones. Electroacoustic composition, created from sounds of the laboratory, for the 2012 play by Lucy Prebble about a love affair that develops on a clinical trial. At The National Theatre (Cottesloe), directed by Rupert Goold – a co-production with Headlong. A collaboration with Punchdrunk to research a novel effect – one that creates a visceral feeling of deep bass sound, without a clear awareness of its source. Deployed in It Felt Like a Kiss – a show by Punchdrunk and Adam Curtis for The Manchester International Festival, 2009.